Normally, when a restaurant receives numerous accolades from the print media and yearly awards, there are some lofty expectations. More often than not, these places also are well-known and are easy-to-locate. If we use this model, then Koon Bo does not fit the mold of an award-winning restaurant on the surface. Located in a very non-descript plaza on the corner of 41st and Fraser, one could easily miss it if they didn't know about it. That was the case for many of my softball teammates when I suggested we head to Koon Bo after our tournament at nearby Memorial Park. For me, this was not my first visit. 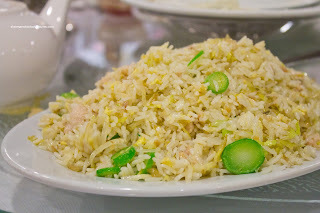 I had been here many years pr ior and had 2 good food memories: their Hand Shredded Chicken and Peking Duck. 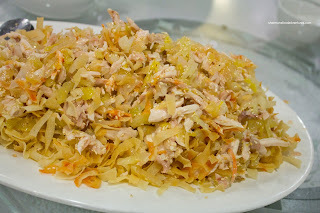 It's no wonder I remembered the shredded chicken because it has been one of the CRA-winning dishes among others. Naturally, we started with the Hand-Shredded Chicken Salad consisting of chicken meat, pickled vegetable, jellyfish and wonton crisps seasoned with sesame oil, soy and sweet chili sauce. As simple of a dish this may seem, it was truly delicious. 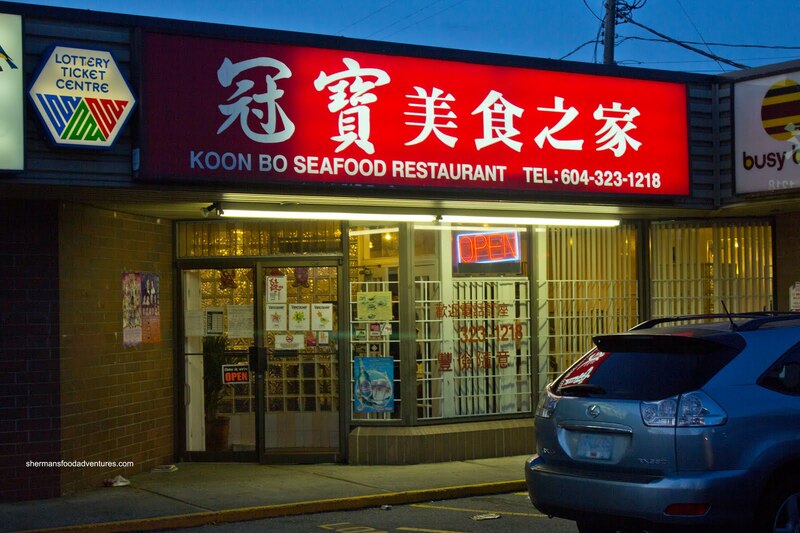 There are many places that make their own version; but the flavour balance of the one at Koon Bo is hard to beat. There was the sweetness from the chicken and sweet chili and the salty tartness of the vegetable combined with the myriad of textures provided by the chicken, jellyfish and crisps. Another signature dish here is the Honey Garlic Pork with Fried Tofu. Bear had spotted it at another table and it made him a happy camper when he found out we had ordered it. Hey, do bears camp? I digress. 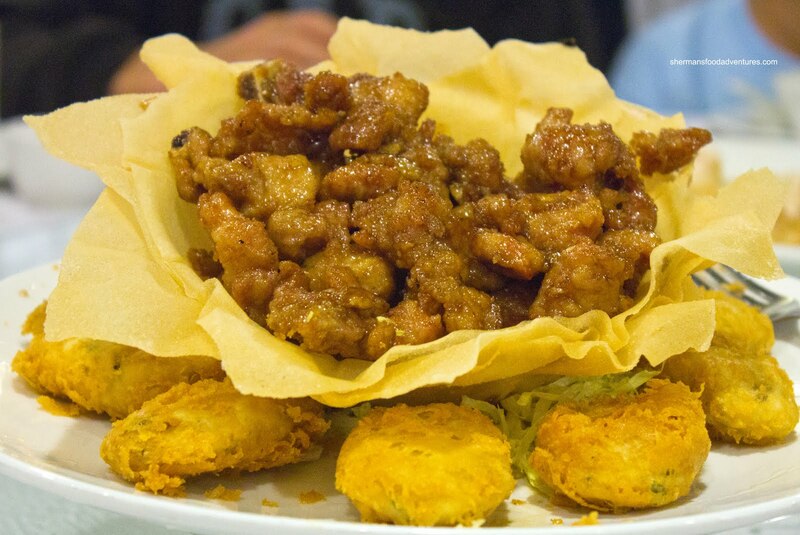 The honey garlic pork consisted of cut pork chop served in a fried wonton wrapper bowl with fried tofu around it. We all agreed that this has got to be one of the better attempts at honey garlic pork. The pork was moist with a slight resistance and crispy on the outside. It was bathed in a honey garlic sauce that was very well-balanced. It wasn't super sweet and had good hits of garlic. The fried tofu was interesting in that it was a mixture of tofu and veggies. The outside was super crispy while the inside was soft and delicious. 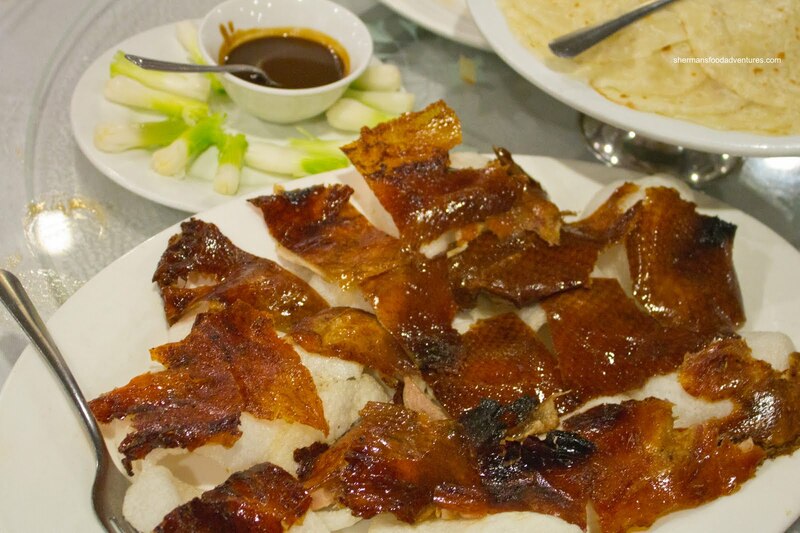 And much like last time, we got the Peking Duck served in 2 courses. We started with the crispy duck skin with crepes. Much like the one at Red Star, the duck skin was crisp with very little in the way of fat. It made it easy for everyone to eat without needing to navigate around the chunks of fat. The crepes were thin and quite good; but they were a bit hard to separate with some tearing apart. For the second course, the Duck Lettuce Wrap was also very good. It was a very large portion and there was a clear indication that they did not skimp on the duck meat. 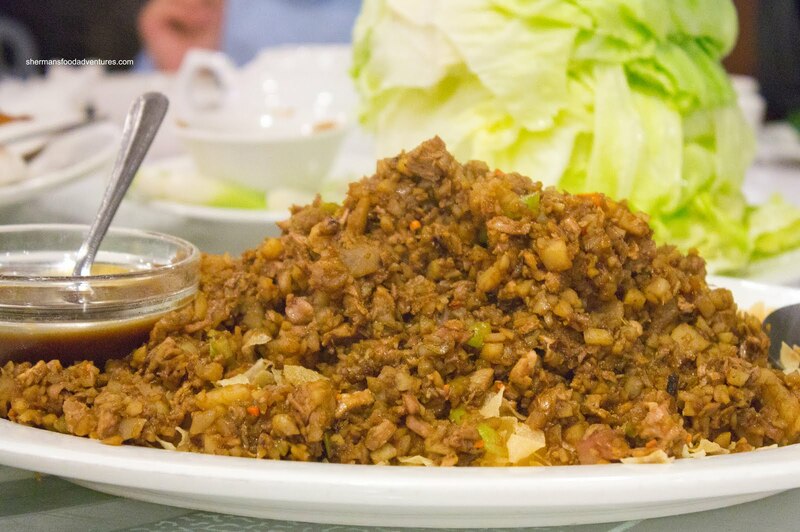 There was easily enough filling for all the lettuce cups and more. The filling was slightly on the softer side and a tad salty. Otherwise, it was meaty with plenty of flavour. Dr. No Share (formerly Dr. 911) shockingly decided to get in on our dinner by sharing with us. I guess he couldn't resist the dishes we had ordered. For his choice, he selected the Peking Pork Chops. 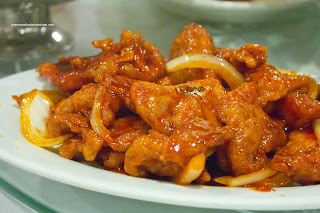 This was another well-executed dish with perfectly fried pork chop pieces which were moist and tender. I particularly liked how they cut the pork chops into eater-friendly sized pieces. The sauce was practically flawless in viscosity since it clung onto each piece of meat without creating a pool at the bottom of the plate. It was the right balance of sweet, tart and savoury. 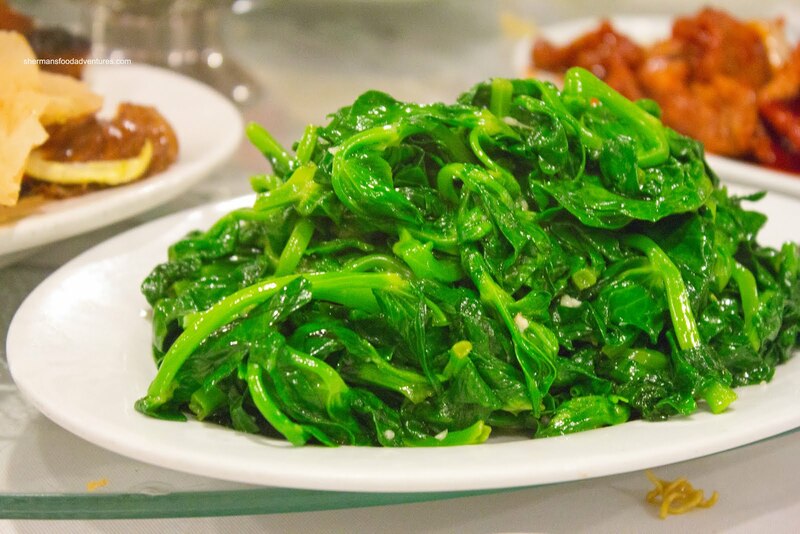 For our one requisite veggie dish, we got the Stir-Fried Pea Shoots with garlic. At this point, it was merely predictable that they would execute this item to perfection. The pea shoots were vibrant, cooked just enough and seasoned properly. 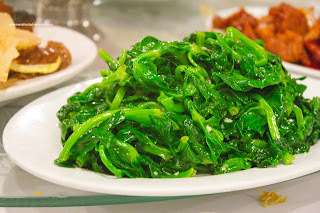 The pea shoots exhibited the desired crunch and chewiness while being completely cooked. Definitely enough wok heat since there was no pool of water at the bottom of the plate. Instead of ordering plain white rice, we opted for Milhouse's favourite being the Salted Fish & Chicken Fried Rice. The rice was exactly the right texture being chewy with a nice bite. It wasn't dry though while still showing off the obvious wok heat it was prepared in. It was seasoned just right as well with enough saltiness from the fish. 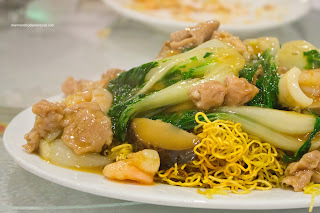 Lastly, we had the Special House Fried Noodles. Yah, this is not really a dish one would necessarily order at Koon Bo; but we all had agreed on one rice dish and one noodle dish. 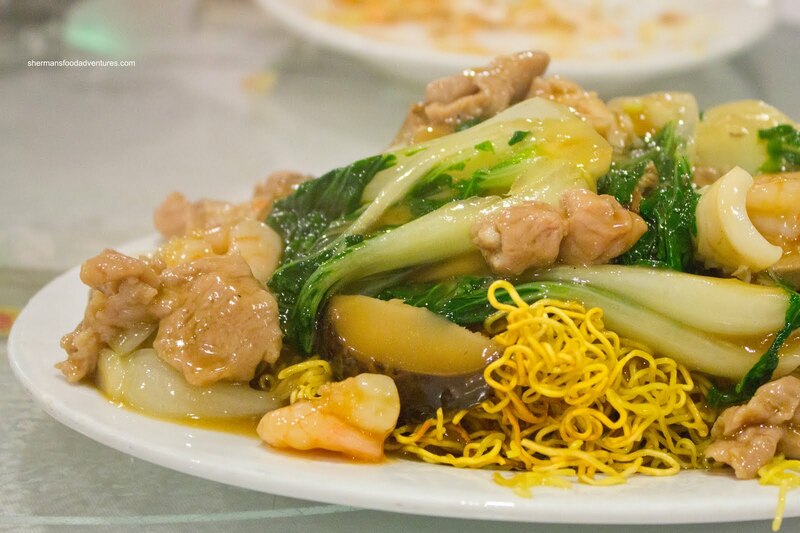 In the end, it was actually pretty good with plenty of shrimp, chicken, squid, BBQ pork and bak choy on top of crispy noodles. The sauce was plentiful and flavourful which was a positive and a negative because the noodles got a bit soggy. Still a good plate of noodles nonetheless. 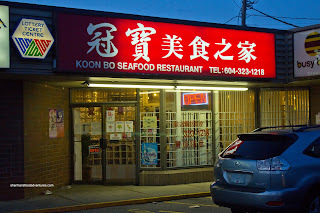 In fact, Koon Bo was exactly as good as I had remembered. It was pretty much a consensus at our table that the food was delicious and well-executed. Sure, not everything was perfect; but there were no duds. The prices were a tad high for this class of restaurant and the service is pretty basic; yet we'd gladly return for some of their specialties. Thanks for the recommendation, Sherman. Your review is spot on. The shredded chicken dish and PK duck were good! Note of caution, don't go for dinner there on CNY eve or any other important night. We ate our dinner with people standing crowded around our table giving us the "stink eye" so that we can hurry up and finish, and they can get our table. We thought we were back in Hong Kong again! @Junerose So glad you liked it! Yah, the place is cramped and too small... They should move!